Instant vegan coffee creamer / tea creamer. This is powdered creamer in single-serve sachets produced by Saving Opus One of Georgia USA. There have been several attempts to fill this gap in the market and none have yet been successful (anyone remember Soya Maid from Pritchitts, the makers of the ubiquitous Millac Maid?). Does this latest creamer finally give vegans a break from black coffee when away from home? 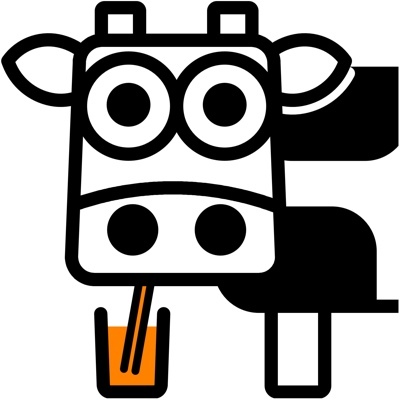 We recently introduced the Control Cuppa to our plant milk tests. This is a cup of tea made with Provamel Red - the gold standard for unsweetened soya milk. 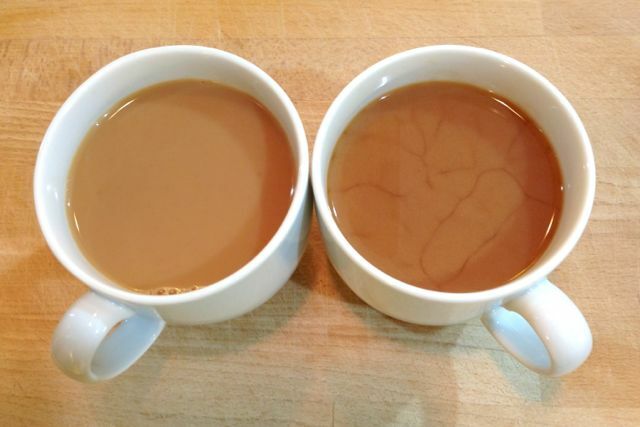 We thought it best to compare SoyGo with the Control Cuppa to see how it fares. 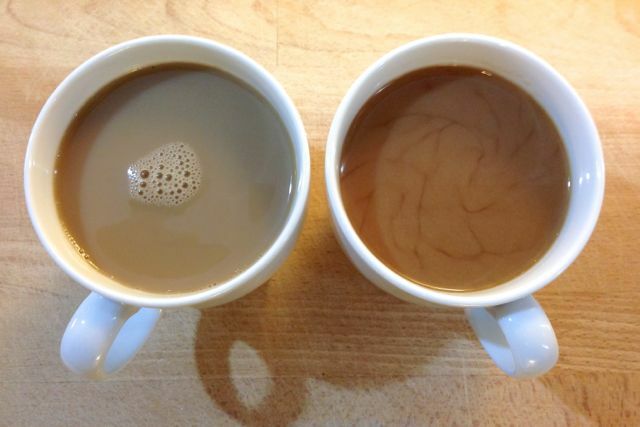 TEA TEST: Control Cuppa on the left. SoyGo on the right has been stirred...stirred again, then left for 30 seconds. In tea, the results were not good. Colour wise, the SoyGo performs just fine. It has plenty of body to whiten the tea. The flavour is impaired though, with a distinct soy taste, a slight taint from vanilla, and a noticeable sweetness too. The texture is not bad...we couldn't describe it as powdery or gritty, so they got that bit right. The creamer does have a tendency to settle when left to stand though, giving your drink a sort of crazed appearance. We'd rather drink black tea than drink tea with SoyGo. We had higher hopes for the coffee test, where a hint of vanilla and a little sweetness aren't so critical. We used instant coffee, as you would with instant creamer, and didn't add sugar. The results were pretty poor again, with that soy taste still present and the SoyGo failing to take the bitter edge of the coffee in the way soya milk does. The creamer also separated again when left to stand for just 30 seconds, even after the second stir recommended on the pack. We'll stick with black coffee on the go for a while longer we think. There are a couple of other vegan coffee creamers on the market at the moment and we'll try and get hold of these in the near future to compare them to SoyGo. 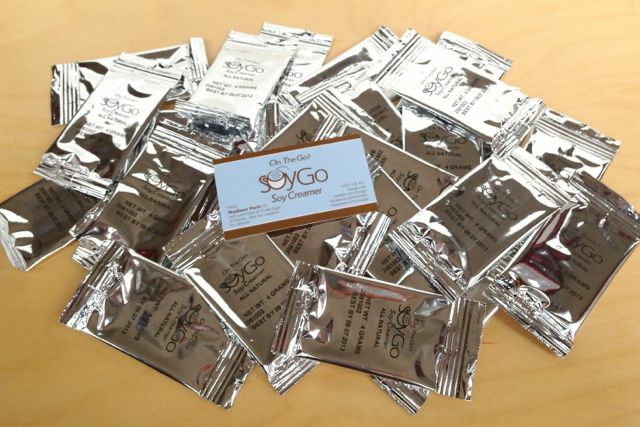 SoyGo is available to buy in the UK through Viva's online store. Ive been trying to find a powder coffee whitener for a while now, attempting to take a small pot of my almond milk to work normally results in leakages and a very messy bag! 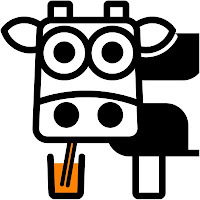 I've just ordered TOM SOJA Natural Instant Soya Drink, so will be interesting to see how it shapes up! I have found overall it is pretty good, tastewise, however the sachets are a little small...so if you like your coffee white you may have to use two! you can get it in a big box as well. Would love a review of the above please :) The whity one! 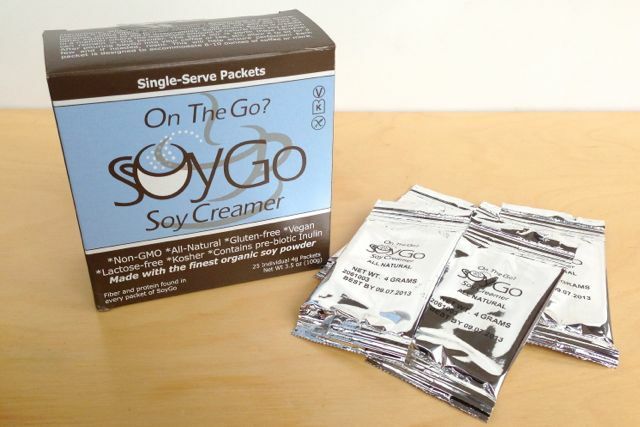 Where can I buy the SoyGo creamer? all the links seem to be broken. Any one got any in a cupboard??? Viva! shop on line used to sell it as I bought some from them. I didn't like it though as it made a greasey top to the tea or coffee.